Wood Ducks are so colorful. I have painted little mini 1" Mallard Duck pins and wanted to do a quiet peaceful pond or lake piece on a calm fall day. 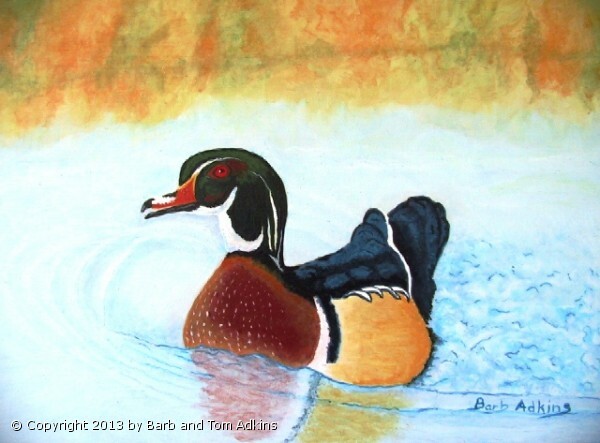 A beautiful Wood Duck serenely swimming in still waters seemed to be the thing to do. This is Wooduck has been donated to the Center for the Arts Fundraiser. Please look below to see a framed Giclee that is available. Giclee Prints can be on high end archival paper or on Canvas. Please Call for sizes and prices. The 1" edge of this painting is painted as a Gallery Edge. It is painted to match the picture. It may be framed or hung on the wall as is. It may also be framed in a silhouette frame that will show off the Gallery edge painting. I like to paint the edges as part of the picture to give you a choice of how to hang it. When you are coming into a room or down a hall the effect is to give a color visual of something to see that is different or unexpected, rather than the regular edge of wood frame.